When we began planning our daughter's 4th birthday, she was really interested in sleeping outside in our backyard. We weren't quite ready for a sleepover party, but came up with the idea of a Pretend Camp-Out party. This turned out to be a fun and easy party right in our own backyard. We looked for a "girly" camping invitation, but fell in love with this cute tent invite from Julia D. Azar. We added gold glitter to the firefiles and also a red gingham ribbon bow to the top. 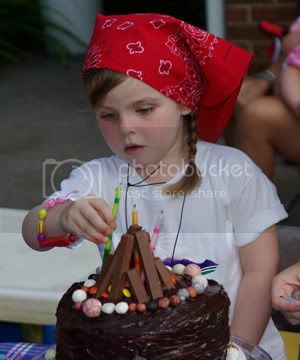 The wording says "Come sit around the campfire and have a s'more, Celebrate with us 'cause Mallory's turning Four!" Favors & Activities: When the guests arrived, we had a friend manning a table where the kids could make friendship necklaces or bracelets with wooded beads and string. We also had little galvanized buckets labeled with each child's name that contained a red bandanna, glow sticks, and gummy worms. The kids loved wearing the bandannas! They all headed down to the playset in our backyard. We set up a tent nearby so they could play in it as well. Food: For the cake, we made a simple two layer cake and iced it with chocolate icing. After making a ring of candy rocks on the top, we built a "fire" out of Twix bars and Reeces Pieces. The candles were stuck through the middle of the Twix bars and it ended up pretty cute. We stuck with standard campfire fare for the kids (hot dogs, chips, baked beans) and grilled up some pork tenderloin for the adults. Fun Extras: We special ordered a t-shirt with a camping scene embroidered on it along with Mallory's name. It was inexpensive, and our daughter loved having a special outfit for her party. We also had lots of fun making S'mores by the firepit. The party ended with a pinata and lots of candy. It was lots of fun to pretend, but we were quite glad we had only one four year old to get to bed at the end of the night! Have you thrown a camp out party for your child? What was your favorite part? Follow Sassafras Paper's board camp out party on Pinterest.